The FIS Official Grand HIRAFU Cup 1st & 2nd stages, originally scheduled for April 9-10, has been cancelled. of snow to be insufficient for creating the course this year. We will hold rounds 1 and 2 of the FIS-certified “Niseko Grand HIRAFU Giant Slalom Cup” on Apr 9 and 10, 2016. Our very own Ryunosuke Ohkoshi will be participating as a competitor. Please come to watch the competition and cheer him on! To accommodate this competition, there will be several course restrictions and closures from Apr 7 to 10, 2016. *The Onsenzawa course and the King area access path will be closed completely. For details, please check the map below. 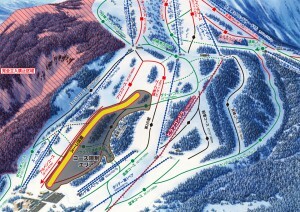 *Furthermore, from 10:00 to 12:00 on Apr 7, the Alpen course will be temporarily closed for skiing/riding and access. We appreciate for your kind understanding and cooperation.